Anyway, it was a great dress at the time. And I had a pretty great evening, due in no small part to how awesome I felt in that dress. The resolution for today then: pack up three dresses and take them to Brown’s to be donated to a very worthy cause. Fairy Godmother Ezmy to the rescue! Update on previous resolutions: Saturday breakfasts are still going strong. I made apple cinnamon pancakes this morning – oh so good. And the stroller is clean and up for sale. Oh and I researched all of the candidates in our riding, sent a couple of emails to clarify platform positions and now feel ready to vote. Are you ready? ← apr 15: election season! jeez, no photo credit !!! hahaha! Beautiful picture :) And great idea, thanks for sharing about the Fairy Godmother. I recently wore my highschool formal dress for a murder mystery party and it was hilarious, but I don’t think I’ll be wearing it again. I really like that dress! 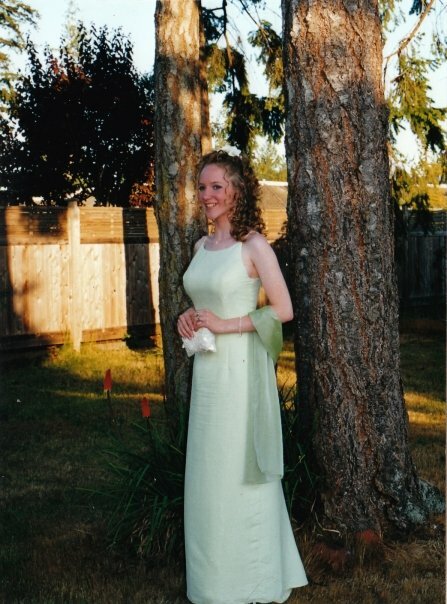 It looks way more modern than my old black velvet with puffed sleeves (eek), but then my prom was in the 80s. I managed to find several dresses to donate, including few that I LOVE that don’t fit, and it made me so happy to know they are going to a good home! It’s a nice feeling to share right in our community, and I keep checking their FB group hoping to catch a pic of someone in one of my dresses. I just love what this organization is doing, it brings a big smile to my face.